What’s the first thing you think of when someone says Portugal? For those of you that didn’t mention football, it’s likely that beaches popped into mind. After-all, Portugal is famed for its long, golden beaches surrounded by turquoise waters straight out of a holiday brochure – they are simply the best beaches in Europe. Regarded as the most picturesque beach in the Algarve, Praia da Dona Ana has golden sands and spectacular cliffs all surrounded by calm, crystal-clear waters. So it’s little wonder that this beach is so popular, especially at the weekends – be sure to arrive early if you want one of the best spots. You can even hire deck chairs and parasols for as little as €10 on the day. Being just a short walk from central Lagos, there are many beautiful local villas to rent near the beach. Or if you prefer the outdoors, there are a few nearby campsites available. Just keep in mind that it’s illegal to wild camp in Portugal. The Costa do Sol is Portugal’s golden coast. 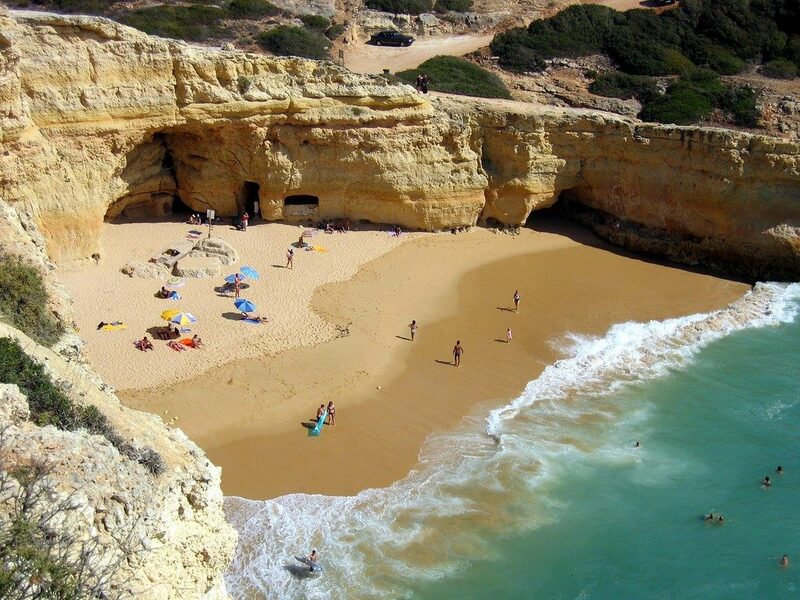 Situated in Lisbon, this group of beautiful beaches are perfect for working up a tan. Particularly popular is Guincho beach, located on the Estoril coast, as it combines dreamy sands with dramatic and spectacular scenery. It isn’t the best beach for sun-worshippers or swimmers due to the steady breeze that hits this coast. However, it is an absolute haven for surfers and other water sports. You may even spot the odd group of dolphins swimming close to shore. 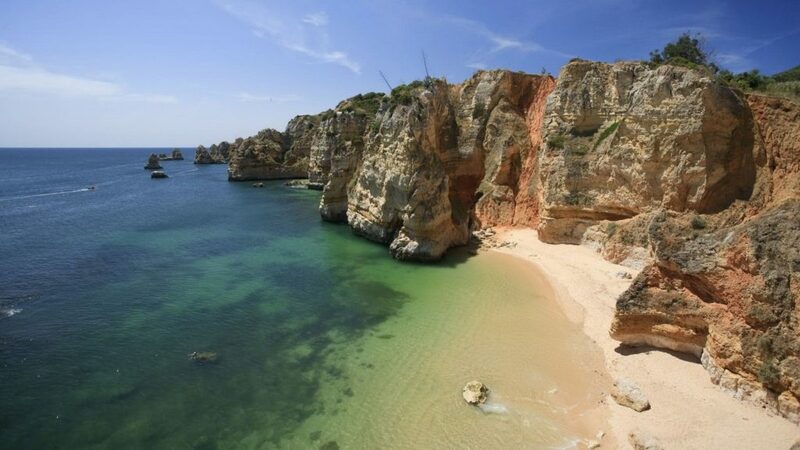 Located in the municipality of Lagoa, this stunning beach is so memorable as it is accessed via a man-made tunnel filled with interesting fossils. The beach itself is completely surrounded by these cliffs, sheltering it from the wind. Keep in mind that there are very limited facilities nearby, with no close hotels or resorts; so if you are planning a day trip to Praia do Carvalho, it’s important you bring supplies such as food and water with you. However, this has its advantages as it means the beach is usually relatively quiet – perfect for a family picnic. Avoid sitting directly under the cliffs, as there is a risk of rocks falling at any time. The best way to get to Praia do Carvalho is to stay in a hotel in nearby Carvoeiro and hire a car as the beach does have parking available. Praia dos Pescadores, known as Fisherman’s beach, is one of the most popular tourist beaches in Portugal. Historically, local fishing boats would have set sail from this beach – you can still see a few colourful fishing boats scattered along the beach today. As with any blue flag beach, you can expect to find incredibly clean crystal-clear water as well as impeccably clean sand – perfect for the kids. It’s even easily accessible via an escalator that will take you down to beach level. There are a lot of amenities nearby including toilets, showers, cafes and particularly good seafood restaurants. 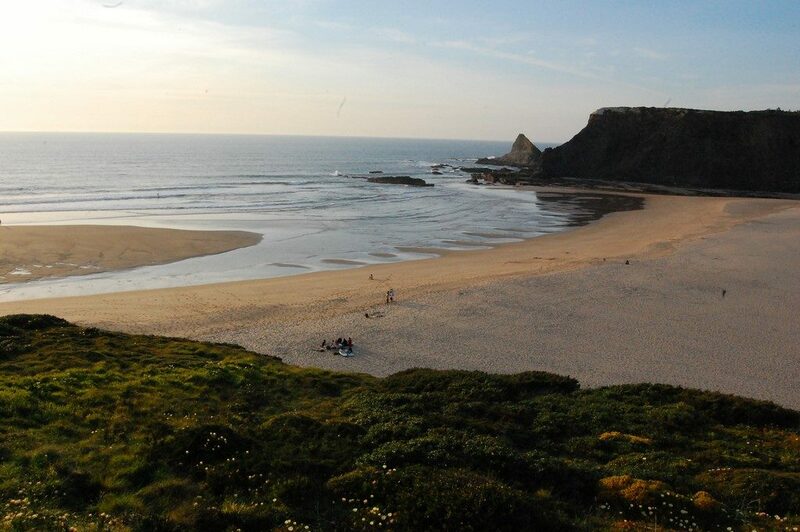 Praia de Odeceixe is a blue flag beach that is also a part of the Vicentine Coast Natural Park. The 4km walk from the village of Odeceixe is really pleasant and gentle; but for those that don’t want to walk, there is a road train that operates during the summer months. Popular with surfers, the beach is relatively quiet meaning you won’t feel overrun by tourists. But being blue flag, there are still lots of facilities nearby. Odeceixe itself is a picturesque, laid-back village with a beautiful windmill and lots of reasonable hotels nearby if you want to stay. Otherwise, the village is easy enough to get to by hire car and is around 1.5 hours from Faro airport. Images by Ajith Kumar, Richard King and lizoleeta, and used under Creative Commons license.